The beauty above is Discoscaphites iris (Conrad, 1858) from the Owl Creek Formation of Ripley, Mississippi. Megan Innis and I collected it during our expedition to the Cretaceous-Paleogene boundary in the southern United States last summer. It is a significant index fossil in biostratigraphy: the Discoscaphites iris Zone is the latest in the Cretaceous (the late Maastrichtian Stage). This animal lived in the final days of the Mesozoic Era just before the mass extinction 65.5 million years ago. Discoscaphites iris is an ammonite, a type of extinct cephalopod mollusk related to the modern octopus, squid and nautilus. It had a planispirally-coiled shell with chambers divided from each other by complexly-folded walls. If you look closely near the top of the fossil above, you will see where the shell has flaked away revealing an internal mold of sediment and a peek at the folded walls inside. “Ammonite”, by the way, is a very old term for these fossils. Pliny the Elder himself used a variant of the name, which comes from the Egyptian god Amun with his occasional coiled ram’s horn headgear. 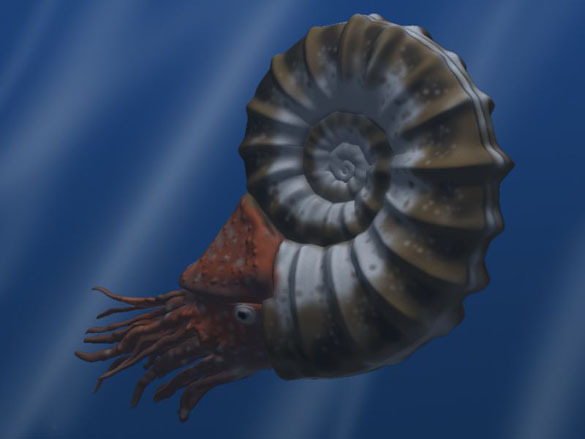 Reconstruction of an ammonite by Arthur Weasley (via Wikipedia). 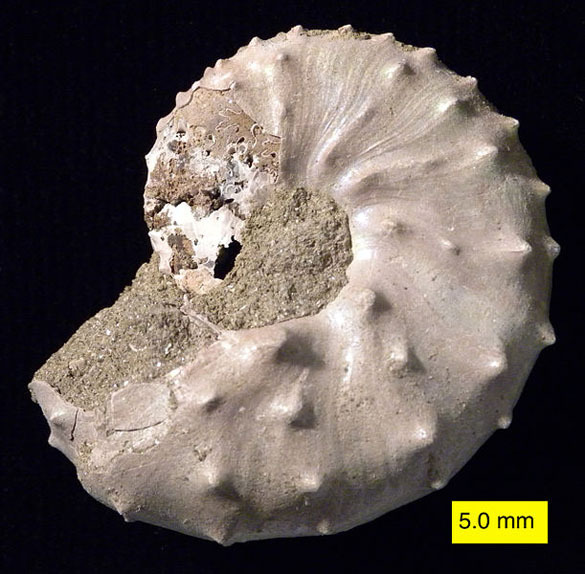 Ammonite shells were made of the carbonate mineral aragonite. This is the mineral that makes many modern mollusk shells have prismatic colors, which we call nacreous. You may know it best as “mother of pearl” or as pearls themselves. Aragonite has an unstable crystal structure and so is not common in rocks older than a few million years. The original aragonite in our ammonite fossil is thus a bonus. In an oddly topical note, Discoscaphites iris was recently found in the Upper Cretaceous of Libya, giving it a disjunct range from the US Gulf and Atlantic coasts to the Mediterranean coast of northern Africa (Machalski et al., 2009). Machalski, M., Jagt, J.W.M., Landman, N.H. and Uberna, J., 2009. First record of the North American scaphitid ammonite Discoscaphites iris from the upper Maastrichtian of Libya. N. Jb. Geol. Paläont. Abh. 254: 373-378.